Do you know where the island of Mauritius is? Well, if you ask Brian "BJ" Caldwell, it's really close to heaven. You remember BJ, he's Hawaii's intrepid 19-year old who is sailing his 26-foot sloop Mai (Miti) Vavau around the world alone. He is also trying to complete his epic voyage before his 21st birthday on December 17, 1996 and find a place in the Guinness Book of World Records. When I last spoke of BJ in Water Ways two months ago, he had finished the second leg of his voyage and was preparing for the third. From Hawai`i, he had covered some 7,800 miles and, with only one stop in Vanuatu, had put into the island of Cocos (Keeling) in the eastern Indian Ocean. A few days after my report, according to BJ's parents - Jan and Brian Sr. - BJ had cast off again. His destination was the island of Mauritius (just east of Madagascar) on the other side of the Indian Ocean. Not surprisingly, BJ's parents were overjoyed to hear their remarkable son had made landfall again some three weeks later. Both son and boat had successfully made the 1,200 mile, open ocean crossing, but not without incident. BJ describes sailing across the Indian Ocean as "...a supreme test of tolerance and patience." "The 'balmy' trades scream at near gale force, with no memory of intervals," he wrote. "I could register near 150 miles every day, yet what's an extra few days if the boat's [not] in one piece?" To keep his boat from going out of control down the face of mountainous waves, BJ often trailed his Para Tech Delta sea drogue. And while it slowed his decent, it also slowed his progress. Although on August 16 he wished he had deployed his sea anchor for even more stability. "At midnight," BJ wrote, "with clear skies and 40-knot reinforced trades, a deafening roar approaches in the darkness. An explosion engulfs the boat and we're rolled upside down." "As the keel finally pulls us upright, I switch on a light and scan the catastrophe," he continued. "Quickly praying to God we're still a sailboat, I extract the [hatch board] and look skyward. Miraculously, the spar is still in one piece, however everything but the stick is in a state of pandemonium." It took the rest of that night for BJ to restore some sense of order to his small boat. The most severe damage was a blown out staysail and a broken solar panel. He also found the engine would not start. Two weeks and many masthead-high seas later, BJ finally sailed into the safety of a port on the tropical island of Mauritius. That he is still there is a testament to his reinforced respect for the sea. BJ's mother says her son now has a more adult view of his mortality after his harrowing experiences crossing the Indian Ocean. "The sailing cruisers in Mauritius have convinced him to wait on the weather until the first of November before attempting the next leg to Durban, South Africa," she said. Of course, it could also be the beautiful Mauritian maiden BJ met in a supermarket who has something to do with his taking what he calls a trans-ocean pit stop. Either way, it sounds like he will be back to sea next week. Happy Birthday BJ, and Mele Kalikimaka! I know one wish is coming a few days late and the other a few days early, but I hope they find you safe. For those of us following his epic voyage, we should note that Brian "BJ" Caldwell made the leap from teenager to 20-year-old last Sunday, still moored at the Point Yacht Club in Durban, South Africa. BJ, attempting to become the youngest person ever to sail around the world alone, now has less than a year to complete his circumnavigation. Of course, considering he originally set sail from Honolulu on June 1 and is now nearly at the halfway point, another year would appear to be more than enough time to make it back - especially now that the challenge of the Indian Ocean is behind him. Some calculating minds at the San Francisco Bay area sailing magazine Latitude 38, one of BJ's sponsors, have determined he has already covered some 11,700 miles in 114 days at sea aboard his tiny Contessa 26, Mai(Viti)Vavau. He's averaging a whopping 100-plus miles per day. For the moment, BJ is waiting for a fair weather "window" to open up which will allow him to continue west on the next leg along a very treacherous coastline. As he noted in a recent letter, the danger for sailors comes not just from the storms which blow into the face of the five-knot Agulhas current to create monster waves, but from shipping traffic as well. "Doing 10 knots over the bottom in the heart of the Agulhas," BJ reported, "I had a near-collision with a super tanker approaching Durban. She was on a collision course doing over 20 knots. I brought out the EPIRB (Emergency Position Indicating Radio Beacon) into the cockpit, it was that close! It was my worse experience." During most of his voyage, BJ has made a routine of sleeping in half-hour "cat naps," but that has changed now that he is sailing close to shore and inside busy shipping lanes. From Durban to Cape Town, he plans to stay awake, sail for a day or so, and then put into one of several harbors along the way for some rest. For BJ's parents, Brian and Jan, apprehension seems to be mixed with pride in their son's accomplishment thus far. After all, they were the ones who took BJ on a six-year cruise of the South Pacific when he was nine years old and created his love for the sea. Living together in the confines of their sailboat seems to have also created an uncommon bond and trust between parents and child. How else can you explain the confidence of all three in BJ's success? I know kids his age whose parents won't - or can't - trust them with the family car keys. With her son preparing to battle the elements half way around the world, Jan still takes time to be a mother. Along with her advice to "stay safe," in a recent phone conversation, she also admonished him for not seeing a doctor for an ear infection and reminded him to keep flossing his teeth. "You won't look very photogenic on the cover of a sailing magazine with no teeth," Jan said in her best motherly tone. I am reminded of a quote attributed to Hodding Carter, "There are only two lasting bequests we can hope to give our children. One of these is roots; the other, wings." Or perhaps in BJ's case, sails. With a bit of luck and favorable weather, BJ should be in Cape Town about the first week of the new year. Shortly thereafter, he plans to be sailing up the South Atlantic Ocean on a course for the Caribbean and the Panama Canal. For that leg of his journey, I have a third wish for him: Hau`oli Makahiki Hou! Berth B, Royal Cape Town Yacht Club, South Africa. That's BJ's new (although very temporary) address. I wished Brian (BJ) Caldwell a Merry Christmas when I last wrote of his progress in attempting to be the youngest person to circumnavigate the world alone in his 26-foot sailboat. At that time, he was on schedule and preparing to sail out of Durban for a rounding of Cape Agulhas, the Cape of Good Hope, and then on to Cape Town. Now it's Leap Day - many knockdowns and over two months later - and BJ has finally completed the treacherous rounding of what was originally, and without question more appropriately, named the "Cape of Storms." In the process, BJ made landfall in four ports along the way - East London, Port Elizabeth, Mossel Bay, and Gansbaai - and was forced back into a couple of them several times due to repeated "sou'westers" pushing waves 60 feet high. "It took longer than expected to round the Cape of Storms," BJ said in a letter to his parents, "but is that so unexpected? The extra time bought me safe passage around (what) some might argue (is) the most dangerous promontory on earth." And unlike his first three open-ocean legs after leaving Hawai`i, through the Pacific and Indian Oceans, sleeping under sail was not a luxury BJ could afford. Because of the volume of ship traffic rounding the southern tip of Africa, as well as the foul weather, he needed to constantly be alert for any sign of danger. BJ's passage around Cape Agulhas, although sleepless and under gale-force winds, wasn't without it's moments of wonderment at the water world around him. "The seas were incredible," BJ wrote, "but it just would not have been right without spume, penguins, whales, and the magnificent wandering albatross careening over the wave tops." Now at the half way point in his race against time - to arrive back in Honolulu before his 21st birthday next December and find a place in the Guiness Book of World Records - BJ is nevertheless dogged by his need for sponsors. Doyle Sails and Bainbridge Sailcloth in Cape Town are providing him with a new suit of Spectra sails for the second half of the voyage, but that still doesn't pay the mounting bills. When just the cost of phoning home approaches $500 per month, cash sponsors are important too. "Although I've got new wings, I'm still desperately in need of a title sponsor," BJ wrote. "I'm laboring to finish this on a wing and a prayer." As early as this weekend, BJ plans to set sail to cross the South Atlantic non-stop, continue through the Caribbean, and make his next landfall in Panama. It just could be that BJ and his small red boat would make the perfect image for a corporate sponsor as they make their way through the Panama Canal this spring. As with all sailing plans, the timing will ultimately be left up to the whims of nature, but as for BJ, he continues to be positive. "Sure, any ocean can be bad, but percentage-wise, the rest of the sail home should be a down-wind milk run." For those sailors wishing to read the full text of BJ's letter to his parents, it will be printed in the March issue of the Sausalito-based Latitude 38 sailing magazine. Lying in the Atlantic Ocean, halfway between the Tropic of Capricorn and the equator, and perhaps a third of the distance from Africa to South America, is the tiny island of St. Helena. Worldly sailors speak of St. Helena with fond smiles and refer to its population - and especially its ladies - as the friendliest in the world. Ironically, it was Jan Caldwell, the mother of the globe-circling Brian "BJ" Caldwell, who was relating these facts to me earlier this week. As only a mother can be, she seemed almost more concerned of her son's social contacts than with his heroic exploits on the open sea. BJ, at the age of 19, set sail from Honolulu last June 1 in a self-proclaimed attempt to be the youngest person to sail around the world alone. His vow is to arrive back in Hawai`i before his 21st birthday on December 17. His vessel, a fire engine red 26-foot Contessa sloop named Mai (Viti) Vavau ("Waves from a Distant Storm"), has, so far, served him well. The first leg of his journey took him south and west to the island of Vanuatu. He made some 3,400 miles in 34 days. After a brief 12-day stop for provisions and repairs, he cast off and continued west to Cocos (Keeling), a small atoll group in the Indian Ocean. In all, it was a 4,400-mile, non-stop voyage, punctuated with "bright orange sea snakes," "a near-miss collision with a freighter," and "mountainous seas." By early September BJ had again reprovisioned and was making a westerly transit of the Indian Ocean. And although this third leg was a shorter, two-week, 1,200-mile passage to Mauritius, off the east coast of Africa, it held a larger challenge for both sailor and boat. Under gale-force winds and towering seas, at one point BJ found himself upside down, lying on the inside cabin top and praying for his boat to right herself. Thankfully, she did, and without loosing her mast and rigging. In Mauritius, BJ made his third "pit stop," but this time it lasted somewhat longer than the others as he was forced to wait on the weather. This proved to be a forecast of things to come on his approach to the Cape of Good Hope - more ominously known as the Cape of Storms. BJ next put into Durban, South Africa on November 22. At that time he had sailed nearly halfway around the world - 11,700 miles in 114 days at sea - averaging 100-plus miles a day. Finally, by February 27 - over three months, four ports, scores of storms and numerous knockdowns from Durban - BJ was moored safely at his halfway point, the Royal Cape Town Yacht Club. For this port of call, provisioning and repairs also included new sails from Doyle. On March 8, BJ left Cape Town and pointed his little sloop's bow northwest for St. Helena. Unfortunately, for the first 400 miles, the weather and seas gave him a constant reminder of his earlier experiences rounding the Cape. Once again BJ found himself praising the virtues of his Para Tech sea anchor as he rode out "45-knot winds and 22-foot waves." During that storm he reported a nearby 40-foot sloop was dismasted. After 17 days and 1,780 miles, BJ sailed into the harbor on St. Helena and was back to his 100-mile-per-day average. And even though he told his mother the people are very friendly (she groans at this) - he insists he will be back at sea this week. BJ's next planned stop will be Grenada in the Eastern Caribbean - 3,500 miles to the northeast. If he logs the usual mileage, he will arrive there around the middle of May and then be off to the Panama Canal - and more ports of call for his mother to worry about. Brian "BJ" Caldwell has now completed the seventh major leg in his attempt to sail around the world singlehanded. As of Saturday, he was safely moored on the Caribbean island of Grenada, aboard his 26-foot Contessa sloop Mai (Viti) Vavau. This leg began "as a downwind milkrun" in the middle of the South Atlantic at the island of St. Helena. It covered about 3,700 miles, crossed the equator and took 44 days. It also became BJ's second-longest passage and one which presented him a different challenge than those he had previously experienced. 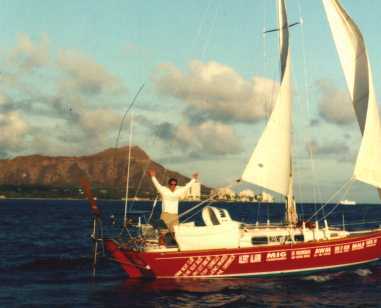 Two weeks out, he had become ill.
BJ was 19 years old when he left Honolulu and sailed west for Vanuatu on his first round-the-world leg on June 1, 1995. His goal was, and continues to be, to complete his circumnavigation before his 21st birthday on Dec. 17, 1996, and find a place in the Guiness Book of World Records. His first passage was made in 34 days and covered some 3,400 miles, but BJ's second leg was longer still. Once again averaging 100 miles per day, he sailed non-stop to Cocos (Keeling) Island in the Indian Ocean, a distance of 4,400 miles. The third leg of BJ's voyage took him 1,200 miles across the storm-tossed Indian Ocean to Mauritius, east of Madagascar, and again he made 100-mile days. By November he had made leg four to Durban, So. Africa. Leg five, around the Cape of Good Hope, from Durban to Cape Town, turned into a multiple-passaged effort due to high winds and seas. BJ was required to put into protective ports such as East London, Port Elizabeth and Mosel Bay during his nearly two-month rounding of that "Cape of Storms." Once BJ was well away from Cape Town, and on leg six to St. Helena, he was no longer dodging storms and was back to making his customary 100-mile-days. He sailed 1,780 miles and made landfall in 17 days. In his most recent leg, from St. Helena to Grenada, BJ's daily average dropped off somewhat, but considering he spent a windless week in the Inter-tropical Convergence Zone, otherwise known as the doldrums, his time wasn't bad. It was, unfortunately, his health that required his attention. "He called us from Grenada," said his mother, Jan, "and said he had twice discovered blood in his stool during the passage. He also had had blurry vision, headaches, and a ringing in his ears." Although he hadn't seen a doctor at the time of the call, he suspected it had something to do with the water in his boat's tank. It had become so "smelly," he was overjoyed to catch rain water to drink. "One of the first things he was going to do was to visit a doctor," Jan said, "and then scrub out the plastic tank with bleach. "Other than that," Jan went on, "he seems to be in great spirits. He must be feeling better because he said he and a friend were headed out to find a MacDonald's or Pizza Hut for something to eat." BJ plans to spend about a week in Grenada reprovisioning and then will set out for Colon, on the Caribbean side of the Panama Canal. That leg covers about 1,100 miles, so if he remains consistent with the past, he will be heading into the canal by the middle of June. BJ has been fortunate in having many donations from individuals as well as corporations, but again it needs to be mentioned that BJ's (and his parent's) expenses for this record attempt are staggering. Just the phone bill last month topped $800.